RIO DE JANEIRO (AP) — Sunlight seeps through holes in the roof, illuminating the graffiti-covered walls of an abandoned building where kids created a makeshift dance studio in Rio de Janeiro's Borel shantytown. 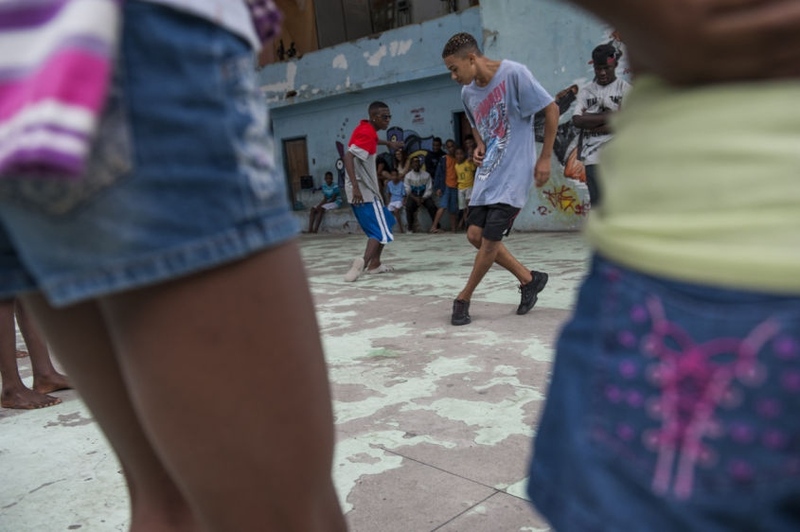 Beads of sweat form on the young dancers' foreheads, then plop onto a dusty concrete floor as the teens glide and pop, shake and dip in a dance form called "passinho," or "little step." Passinho has been around for years, but it recently began spreading through social media, with dancers posting videos of their moves on YouTube and Facebook, sometimes drawing thousands of followers. The dance is most popular in Brazil's poor favelas, where many credit it with keeping young people out of trouble and away from local gangs. In fact, the dance's popularity has benefited from a police crackdown on another late night activity, more raucous "baile funk" parties often organized by criminal gangs and marred by drug use, violence and incidents of young girls being exploited. In passinho gatherings, participants watch as performers square off against each other in choreographed duels, while the baile funk parties tend to attract hundreds of revelers dancing in close contact, increasing the chance of violence, and shootouts between police and gang members. Passinho is a mix of sambaesque footwork, breakdance handstands, free spins and athletic acrobatics, all set to a music heavy on funk hooks laid over snare beats. Music is provided by mostly low-fi sound equipment, sometimes just a smartphone in a dancer's hand. It's a portable dance, with passinho "battles" popping up anywhere there's enough space to do a handstand. The dance's new superstars include Borel slum resident Hilton Santos da Cruz Jr., known as "Hiltinho Fantastico" — Fantastic Little Hilton. Cruz flashes a smile stretching from earring to earring when he talks about going from watching passinho videos online to being crowned a "little step" champion earlier this year on one of Brazil's most popular TV variety shows. During the competition, his rail-thin frame twisted, glided and slid over the floor. "In the past, so many kids were involved in trafficking, or not leaving their house," said Cruz. "Today, passinho is changing everything, helping those on a dangerous path. Me, too." In this Aug. 3, 2013 photo, a boy jumps in the air and grabs his foot while practicing a step from a dance form called "passinho," or "little step," at a makeshift dance studio in the Borel favela, in Rio de Janeiro, Brazil. Passinho is a mix of samba-esque footwork, breakdance handstands, free spins and athletic acrobatics, all set to a music heavy on funk hooks laid over snare beats. 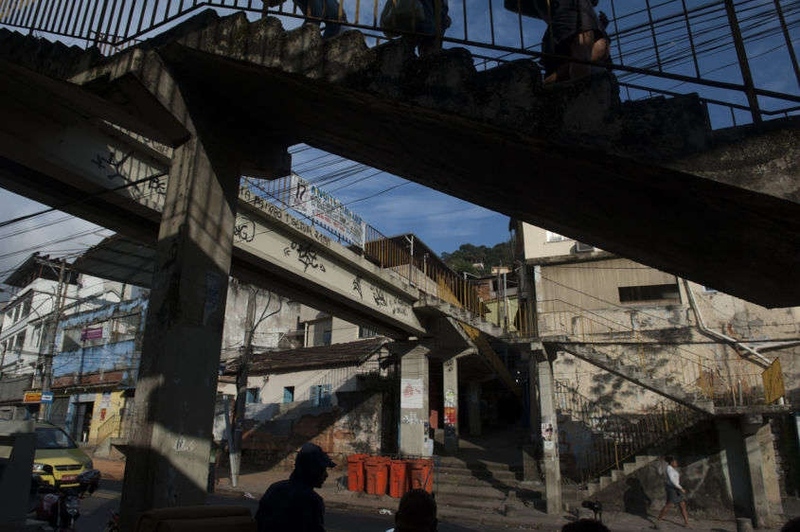 In this Aug. 14, 2013 photo, pedestrians walk in the Borel favela, in Rio de Janeiro, Brazil. 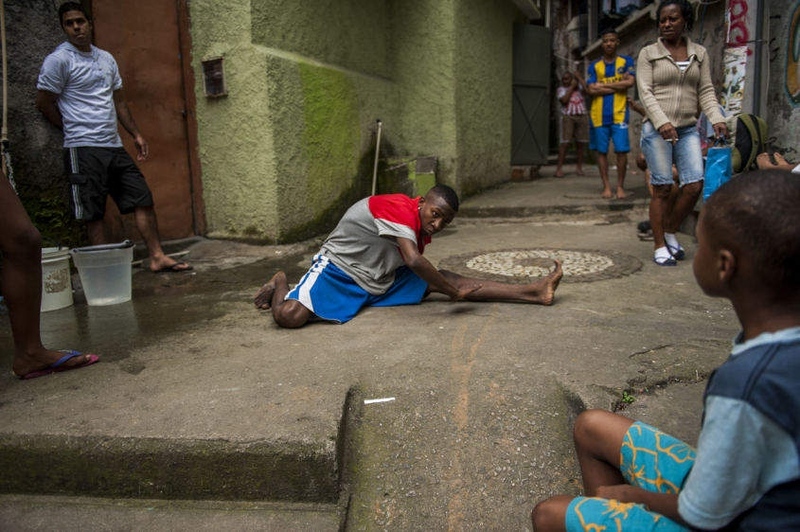 In slums that have undergone police “pacification,” with officers pushing out gangs and setting up permanent posts, a dance form called “passinho,” or “little step,” has sprung up to replace the more raucous “baile funk” gatherings. 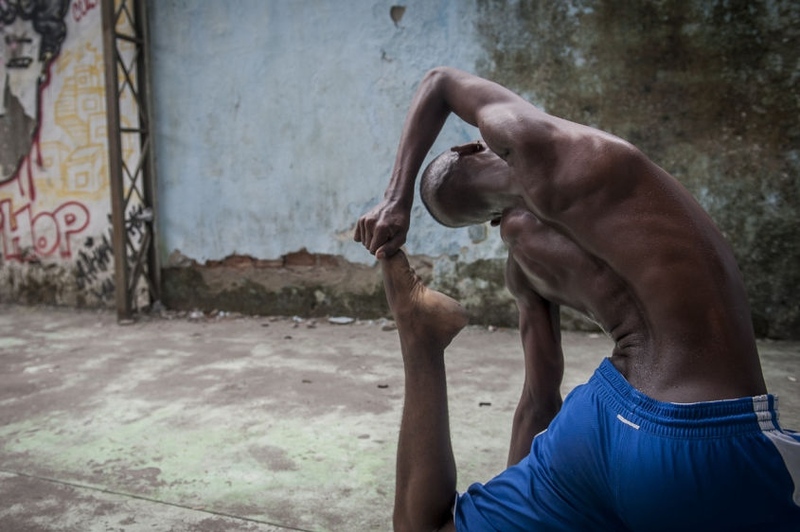 In this Aug. 17, 2013 photo, Hilton Santos da Cruz Jr. practices during a “passinho,” or “little step,” session at a makeshift dance studio in the Borel favela, Rio de Janeiro, Brazil. The dance’s popularity has benefited from a police crackdown on another late night activity, more raucous “baile funk” parties often organized by criminal gangs. In passinho gatherings, participants watch as performers square off against each other in choreographed duels. The dance’s new superstars include Cruz, known as “Hiltinho Fantastico” or Fantastic Little Hilton. 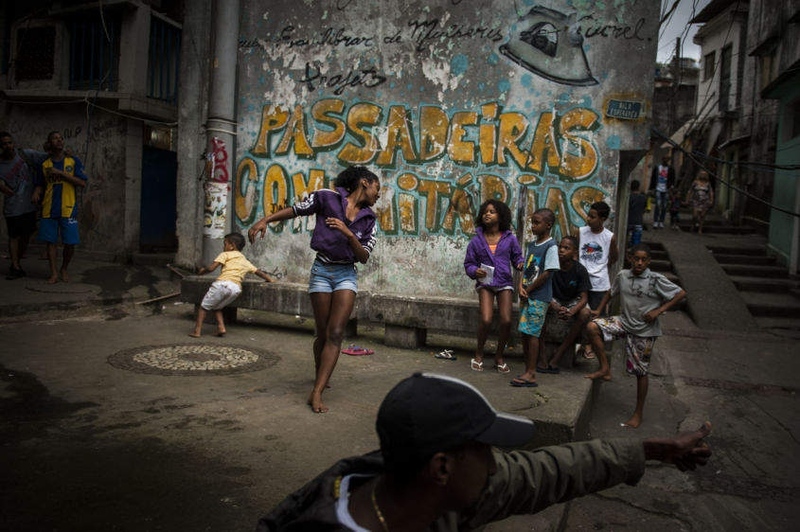 In this Aug. 17, 2013 photo, Marcelly de Mello da Silva, 15, shows off her "passinho," or "little step," moves to a young audience gathered in the Borel favela, in Rio de Janeiro, Brazil. Passinho is a free-form style of dance that is catching on with young people all over the city. The dance borrows from various influences, including samba movements, break dance handstands, and is set to pounding beats on top of soulful hooks. 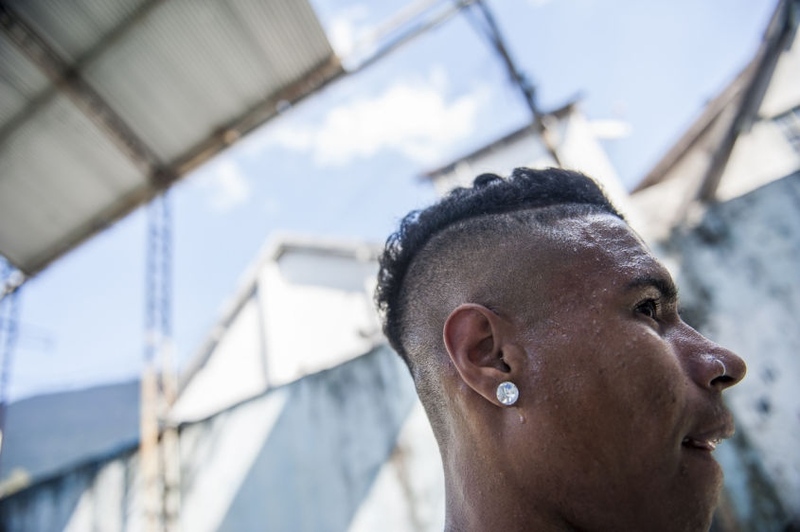 Although Passinho has been around for years, it only recently gained momentum after the baile funk, preferred by drug traffickers, started disappearing during the pacification of the slums. 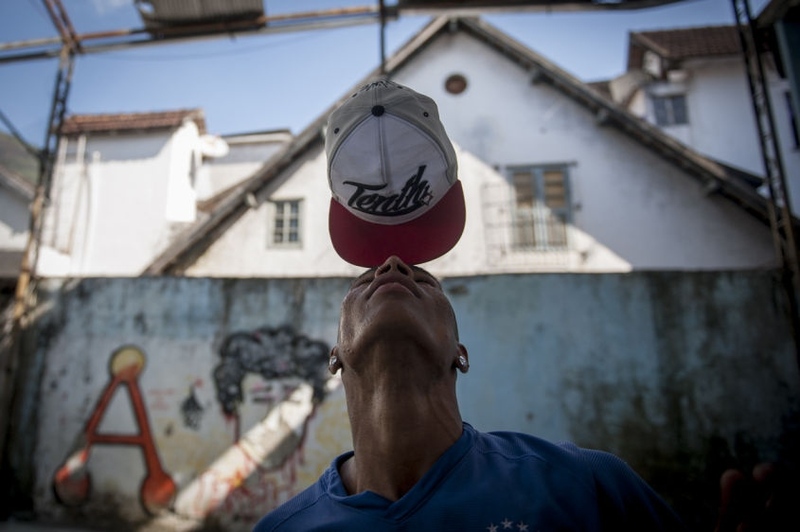 In this Aug. 10, 2013 photo, a young man balances his cap on his nose, a common "passinho," or "little step" move in front of friends at a makeshift dance studio in the Borel favela, in Rio de Janeiro, Brazil. Passinho is a free-form style of dance that is catching on with young people all over the city. The dance borrows from various influences, including samba movements, break dance handstands, and is set to pounding beats on top of soulful hooks. In this Aug. 10, 2013 photo, Marcelly de Mello da Silva, 15, practices her "passinho," or "little step," moves at a makeshift dance studio in the Borel favela, in Rio de Janeiro, Brazil. Passinho is a free-form style of dance that is catching on with young people all over the city. The dance borrows from various influences, including samba movements, break dance handstands, and is set to pounding beats on top of soulful hooks. Although Passinho has been around for years, it only recently gained momentum after the baile funk, preferred by drug traffickers, started disappearing during the pacification of the slums. 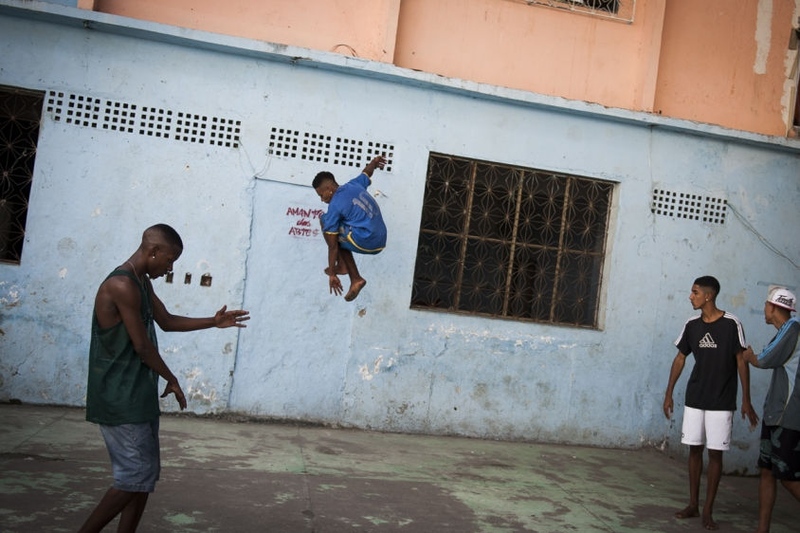 In this Aug. 10, 2013 photo, Hilton Santos da Cruz Jr, left, practices his hand movements while a friend springs off a wall during a “passinho,” or “little step,” session at a makeshift dance studio in the Borel favela, Rio de Janeiro, Brazil. The dance’s popularity has benefited from a police crackdown on another late night activity, “baile funk” parties often organized by criminal gangs. In passinho gatherings, participants watch as performers square off against each other in choreographed duels, while the baile funk parties tend to attract hundreds of revelers dancing in close contact. In this Aug. 17, 2013 photo, Marcelly de Mello da Silva, 15, leads a "passinho," or "little step," instruction session at a makeshift dance studio in the Borel favela, in Rio de Janeiro, Brazil. Passinho is a free-form style of dance that is catching on with young people all over the city. The dance borrows from various influences, including samba movements, break dance handstands, and is set to pounding beats on top of soulful hooks. Although Passinho has been around for years, it only recently gained momentum after the baile funk, preferred by drug traffickers, started disappearing during the pacification of the slums. 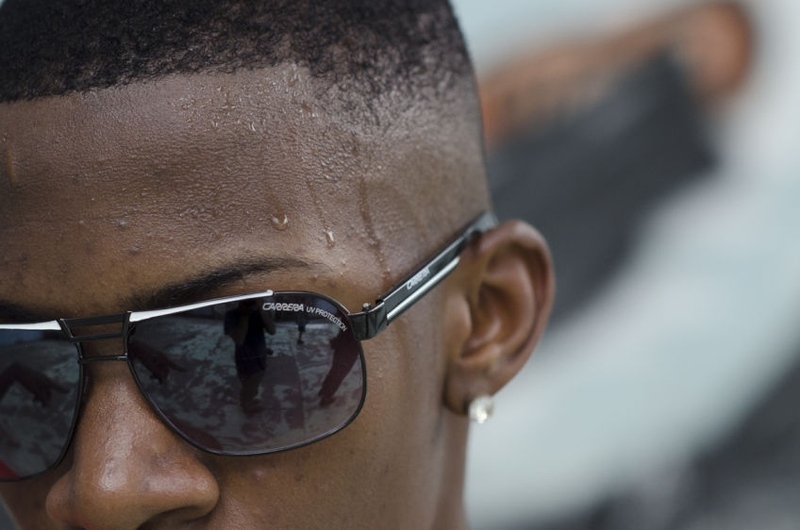 In this Aug. 17, 2013 photo, beads of sweat form on teenage dancer Hilton Santos da Cruz Jr., after a “passinho,” or “little step,” practice session at a makeshift dance studio in the Borel favela, in Rio de Janeiro, Brazil. Passinho has been around for years, but it recently began spreading through social media, with dancers posting videos of their moves on YouTube and Facebook, sometimes drawing thousands of followers. The dance’s popularity has benefited from a police crackdown on another late night activity, more raucous “baile funk” parties often organized by criminal gangs and marred by drug use, violence and incidents of young girls being exploited. 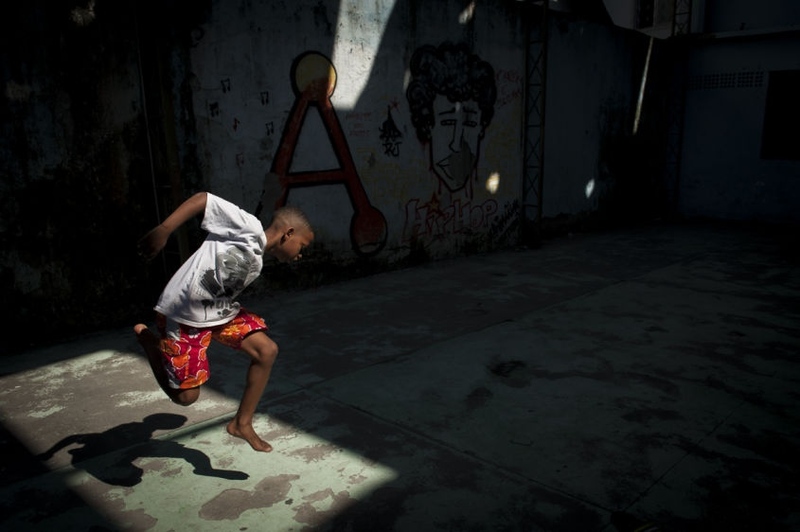 In this Aug. 17, 2013 photo, sixteen-year-old Hilton Santos da Cruz Jr., shows off his “passinho,” or “little step,” moves in front of friends in a small plaza in the Borel favela, in Rio de Janeiro, Brazil. Passinho has been around for years, but it recently began spreading through social media, with dancers posting videos of their moves on YouTube and Facebook, sometimes drawing thousands of followers. The dance’s new superstars include Cruz, known as “Hiltinho Fantastico” or Fantastic Little Hilton. 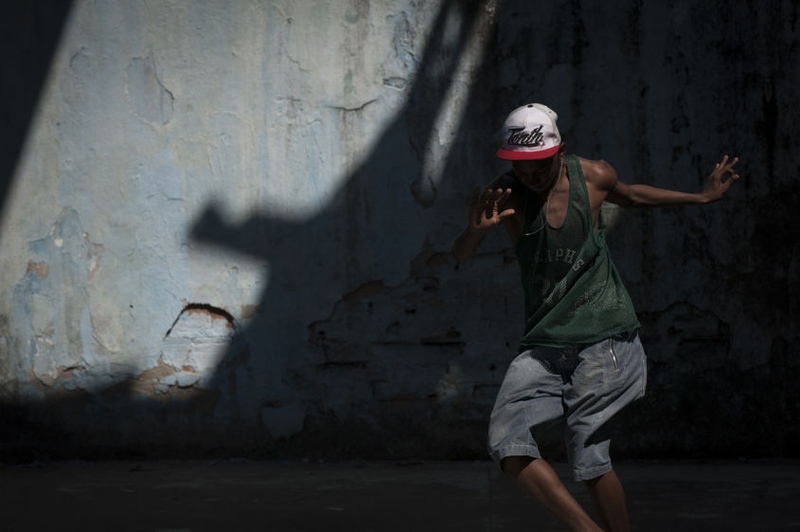 In this Aug. 10, 2013 photo, sixteen-year-old Hilton Santos da Cruz Jr., dances “passinho,” or “little step,” in the Borel favela, in Rio de Janeiro, Brazil. Passinho is a free-form style of dance that is catching on with young people all over the city. The dance borrows from various influences, including samba movements, break dance handstands, and is set to pounding beats on top of soulful hooks.